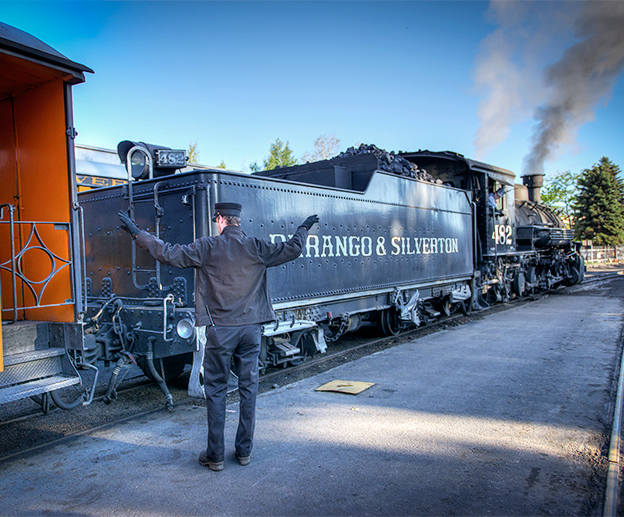 Spending a day riding the Durango Silverton Narrow Gauge Railroad is a step back in time. 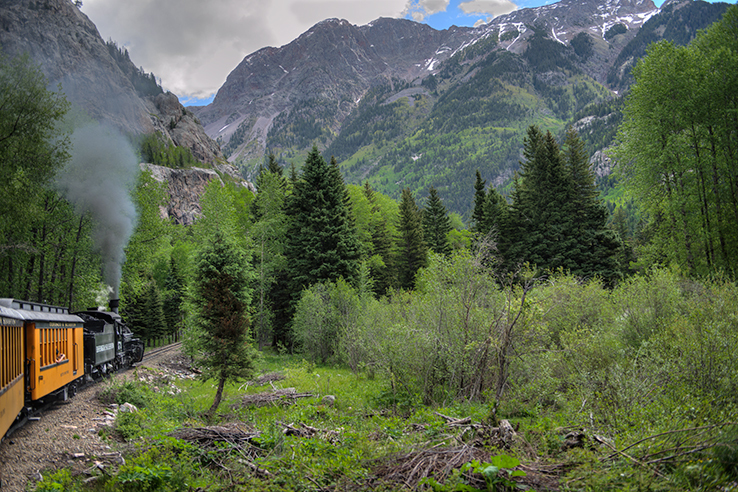 These old steam trains were working these tracks from Durango to Silverton back in 1800’s. The line was built when the mining boom of the late 1880’s struck the San Juan Mountains of Southwest Colorado. 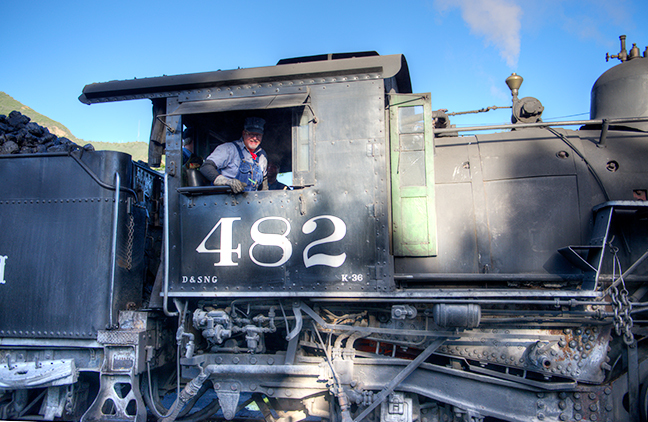 In preparation for our 8 am departure, our Brakeman uses hand signals to the Engineer as he backs up to lock on to the rail cars. A snap of the Engineer who is in a happy mood. A good job if you can get it. This one is shot along the High-Line. The most difficult portion of the line to build. It was cut from the canyon walls in 1882 at a cost of $100,000 dollars per mile. Due to the narrow track winding 400′ above the Animas River, the engineer is restricted to operate the train on a permanent “slow order.” The view looking into the San Juan National Forest is just amazing. In 2012, the park service released dozens of Rocky Mountain Big Horn sheep in this area and they are thriving on these cliffs. 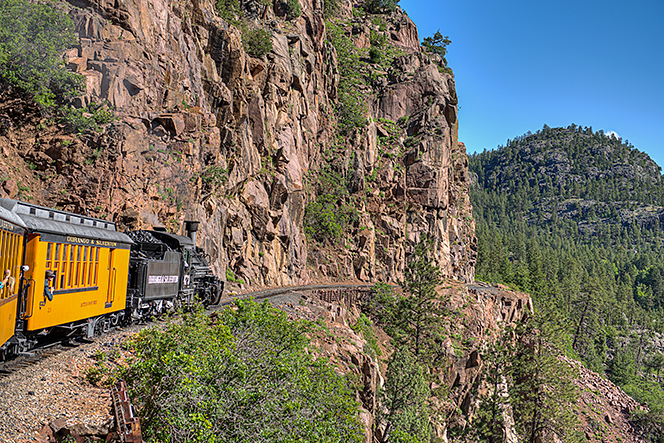 Here is a view as the train steams through a rocky canyon in the San Juan National Forest. Lots of spring greens but still patches of snow in the high peaks as rain threatens our ride. Departing from Silverton after a 2 hour layover for lunch and shopping, we boarded the train with engine 473, a Alco-K28 class. Ten locomotives of this class were built in 1923 by the American Locomotive Company. They were numbered 470-479. The locomotive weighs 127 tons and will develop 28,000 pounds of tractive effort, translating to approximately 900 horsepower. Have I mentioned that I love these old iron work horses? The “chuff, chuff, chuff” the rocking cars, the slow pace and the coal cinders in the air all add to the fun of hearing the train whistle blow. 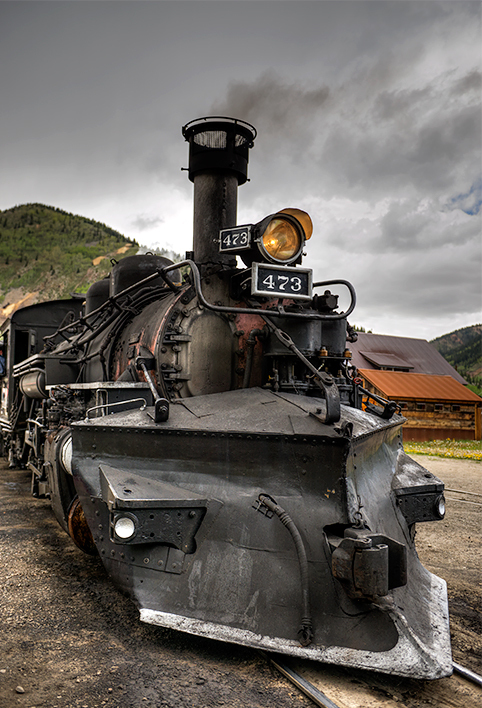 This entry was posted in Colorado and tagged "Durango Silverton Narrow Gauge Railroad", "steam train". Bookmark the permalink.